Rebus (Standing in Another Man’s Grave, 2013, etc.) is working the streets as a detective again—and his loyalty is on the line. When John Rebus left retirement to rejoin the Edinburgh police force, he had to take the reduced rank of detective sergeant. Siobhan Clarke, his former junior partner, is now a detective inspector and theoretically his boss in the investigation of the road accident of Jessica Traynor, a young art student. The two coppers suspect that Jessica’s boyfriend, son of Justice Minister Patrick McCuskey, was driving the car and fled the scene. 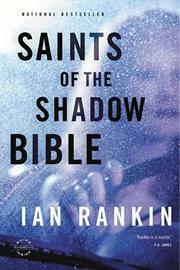 While Rebus is on the Traynor case and the subsequent murder of McCuskey, Malcolm Fox of Complaints is investigating Rebus and the surviving members of the Saints of the Shadow Bible, a police division that disbanded years ago. Rebus, who was only a detective constable back then, had little to do with Billy Saunders, the snitch who killed a man and walked, most likely thank to his usefulness to the Saints. Thirty years later, the snitch disappears, and Rebus must choose whether to back up his former mates while he pursues the crisscrossing mysteries. Although Rebus is the protagonist of this gritty procedural, you see the action through so many other eyes that the hard-living detective is less vivid a presence than in his earlier outings. But the most persistent cop in the shop will still do whatever it takes to crack a case.